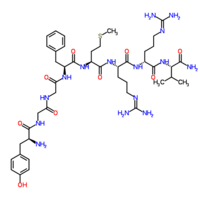 Adrenorphin, also sometimes referred to as metorphamide, is an endogenous, C-terminally amidated, opioid octapeptide (Tyr-Gly-Gly-Phe-Met-Arg-Arg-Val-NH2) that is produced from proteolytic cleavage of proenkephalin A and is widely distributed throughout the mammalian brain. It was named based on the fact that it was originally detected in human phaeochromocytoma tumour derived from the adrenal medulla, and was subsequently found in normal human and bovine adrenal medulla as well. Adrenorphin exhibits potent opioid activity, acting as a balanced μ- and κ-opioid receptor agonist while having no effects on δ-opioid receptors. It possesses analgesic and respiratory depressive properties. 1 2 Matsuo H, Miyata A, Mizuno K (1983). "Novel C-terminally amidated opioid peptide in human phaeochromocytoma tumour". Nature. 305 (5936): 721–3. doi:10.1038/305721a0. PMID 6633641. 1 2 Weber E; Esch FS; Böhlen P; et al. (December 1983). "Metorphamide: isolation, structure, and biologic activity of an amidated opioid octapeptide from bovine brain". Proceedings of the National Academy of Sciences of the United States of America. 80 (23): 7362–6. doi:10.1073/pnas.80.23.7362. PMC 390055 . PMID 6316361. ↑ Sonders M, Barchas JD, Weber E (August 1984). "Regional distribution of metorphamide in rat and guinea pig brain". Biochemical and Biophysical Research Communications. 122 (3): 892–8. doi:10.1016/0006-291X(84)91174-4. PMID 6477570. ↑ Miyata A, Mizuno K, Minamino N, Matsuo H (May 1984). "Regional distribution of adrenorphin in rat brain: comparative study with PH-8P". Biochemical and Biophysical Research Communications. 120 (3): 1030–6. doi:10.1016/S0006-291X(84)80210-7. PMID 6732783. ↑ Miyata A, Mizuno K, Honzawa M, Tohyama M, Matsuo H (February 1985). "Adrenorphin immunoreactivity in rat brain". Neuropeptides. 5 (4–6): 517–20. doi:10.1016/0143-4179(85)90068-X. PMID 2860609. ↑ Xu SF; Lu WX; Zhou KR; et al. (April 1985). "The analgesic and respiratory depressant actions of metorphamide in mice and rabbits". Neuropeptides. 6 (2): 121–31. doi:10.1016/0143-4179(85)90103-9. PMID 4000426.